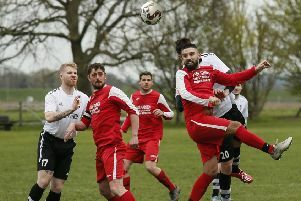 Leverstock Green and bottom side Bedford shared a 1-1 draw in Tuesday night’s SSML Premier Division game. Chris Blunden went close for Leverstock in the 19th minute when he turned in the box and struck a fierce volley which hit the post. The opening goal came in the 25th minute when Louis Bircham was found in space by a ball across the penalty area, and he slotted home neatly for his ninth goal of the season. However, the lead only lasted six minutes, as Samuel Adomako Kyei received the ball on the overlap and slotted home a shot at the near post to level the scores. Bedford went close again six minutes later when Liam McDonagh had to turn Joshua Luther’s shot from a very narrow angle round the post. Fifteen minutes into the second half Jack Gilmartin came on to replace the injured Luke Preedy, and Gilmartin himself only lasted seven minutes as he had to leave the game following a clash of heads with Bedford defender Adam Randall. Bedford keeper Ross Tompkins proved to be his side’s saviour in the second half. On 65 minutes Tompkins saved a shot from Reece Cameron and a follow-up effort from Bircham. Bircham shot just wide from a free kick on 73 minutes, and four minutes from time had another great chance when he was clean through on a quick break, but Tompkins pulled off a superb save to keep out Bircham’s shot. Seconds later at the other end Bedford might have won it, but McDonagh pulled off a great save to tip a shot from close range onto the bar. The action then went straight back to the other end, where a crossfield ball from Bircham eluded a defender and put Blunden through on goal, but he shot wide. There was another near miss for Leverstock two minutes into stoppage time when Lee Waryszniuk got a glancing header to a Tommy Walsh freekick, but not quite enough to divert it inside the post. Bedford: 1. Ross Tompkins, 2. Joshua Luther, 3. Billy Pinney, 4. Adam Randall, 5. George Pessima, 6. Charlie Gregory, 7. Samuel Adomoko Kyei, 8. James Millsdon, 9. Derek Joseph (12. Jason Darvall 76 mins), 10. Alfred Mugabo, 11. Suleiman Bakalandwa (15. Piere Yam Fam 82 mins). Subs not used: 14. Dean Dommett, 16. Olly Swaine. Leverstock Green: 1. Liam McDonagh, 2. Gavin Smith, 3. Joe Horwood, 4. Lee Warysznuik, 5. Liam O’Keefe, 6. Lee Faulkner, 7. Tommy Walsh, 8. Louis Bircham, 9. Luke Preedy (14. Jack Gilmartin 60 mins) (15. Reece McArthur 67 mins), 10. Reece Cameron, 11. Chris Blunden. Subs not used: 12. Tyler Osbourne, 16. David Paredes.